If you're looking for on-ear headphones with exquisite sound and a design to match then the Master & Dynamic MH30 make a fine choice. There's no new-fangle wireless tech, but sometimes simple is best - especially when the sound is this good. What do you want from a pair of headphones? Luxe design, ultra comfort and aesthetic appeal? Or all the new-fangled wireless tech in a glossy, shiny package? A lot of headphone makers cut corners when it comes to their products. No so Master & Dynamic. The MH30 are cut from a different cloth, avoiding kitsch over-shiny plastics and poorly considered components for a far more luxurious take. The aluminium body is robust and lightweight, providing a solid frame on which the leather headband and lambskin-covered earcups sit. The metal is anodised, too, ensuring it's tougher and better-looking as a result, while stainless steel components provide the rigidity where it matters. We've been chucking them into a bag day in, day out and it's not caused any kinks or dents. 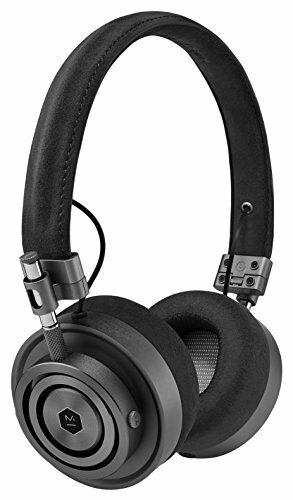 The MH30 is defined as an on-ear headphone, which does exactly what it says on the tin: the earcups press against the ears firmly, but not to excess, for a comfortable fit. Long periods of wear are no drama, which isn't something we can say of other far more "pinchy" on-ears, although we generally find over-ears to be the more comfortable solution. We're particularly fond of the dual 3.5mm headphone jacks, one at the base of each earcup, which means you can choose whether left- or right-side fit is best for you. No more tangling cables around your face if you're a "left pocketed" phone kind of person. That said, the MH30 is a wired product, there's no Bluetooth wireless or any of the Hi-Res Audio certification marks to be found here. So you'll always need that cable connected. Sure, it's a mighty fine woven cable, which avoids tangling (despite its over-long 2m length), and that comes in its own swanky leather box (yep, just for the cable! ), but you might want more up-to-date tech - especially with phones ditching the headphone jack increasingly these days. The Master & Dynamic MH30 is simple in its approach. In addition to the wired-only design, there's no fancy on-headphone controls, nor will you find noise-cancelling tech to keep the outside world at bay. But these cans don't need the latter: the earcups fit so firmly in an almost vacuum-like way that the outside world is largely shut off. We're writing this review with the washing machine on in the background - and can barely hear it. It's like noise-cancelling without the downsides here, so no wind-tear, no surreal sound profile, just excellent isolation. Within each earcup is a 40mm driver, which is a fairly standard size for many on-ear and over-ear headphones. You might not think so to look at, however, as the MH30 maintain a small size and delicate appeal. There's nothing "delicate" or underwhelming about the sound profile, though. The MH30 deliver a wallop of taut bass, while avoiding drowning out other frequencies. There's ample separation of hi-hats and other top-end to give the sound an assertive stereo appeal. The soundstage isn't as wide as some over-ear headphones, though. The B&O Play H9 being a good example of a more relaxed, open listen by comparison - and with a similar ilk of design and materials choice. The main complaint we have about the MH30 is that the mid-range lacks a little "snap". Those snare drums don't cut through quite fiercely enough for our liking; a little extra definition here, and possible yet more sharpness at the top-end would give an even more elegant listen with greater clarity. Furthermore there's the occasional click or pop sound from the headphones frame - it's not related to sound output at all, it's the physical construction (possibly adjusting to different temperatures) - which can prove a minor distraction. If you're looking for on-ear headphones with exquisite design then the Master & Dynamic MH30 is a top choice. The £279 price tag may sound like a lot, but with a build quality to easily rival B&O Play, there's the assurance of longevity, comfort and aesthetic appeal. However, the MH30 doesn't offer the latest in new-fangled tech and lacks some mid-range "snap" for the most balanced listen. So wave goodbye to Bluetooth wireless, on-ear controls and other such fanciful features. That's in-keeping with the design, mind, and sometimes simple is best - especially when the sound is this impactful. The noise-cancelling kings, these over-ears are about £50 more than the M&D, and while their build is altogether more plasticky the sound quality is exceptional. Although they're far larger than the M&D cans, the B&O Play H9 over-ears have a similar level of build quality - plus there's integrated (and subtle) noise-cancelling that's great for listening when travelling. There are cheaper still B&O cans on the market, but we don't think the H7 is quite up to task, while the H8 on-ears are great if that's the fit you're after. If you want small and light on-ears with the benefit of Bluetooth wireless then AKG has the answer. The sound is nowhere nearly as burgeoning as the M&D, though.